Quick Curried Turkey Rice Bowl: quick and delicious curried turkey mince with steamed rice is a perfect light meal. Great for Meal Prep as this can be stored in the fridge for up to a week. 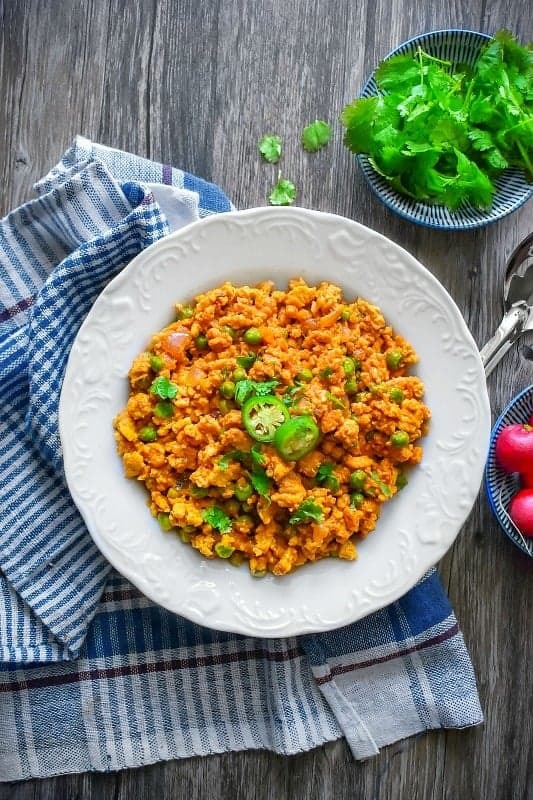 What is Curried Turkey Rice Bowl? It’s basically a bowl comprising of ground turkey curry with steamed rice. Absolutely simple yet amazingly delicious. The recipe comes together in under 30 minutes and feeds 4 people. Curry Powder: homemade or storebought, both works great. Yogurt or Sour Cream: this adds a creaminess to the dish. Ground Turkey: I used lean ground turkey meat to make it even lower in calories. Steamed Rice: I’m using brown rice, but goes great with white rice or even cauliflower rice (for keto). 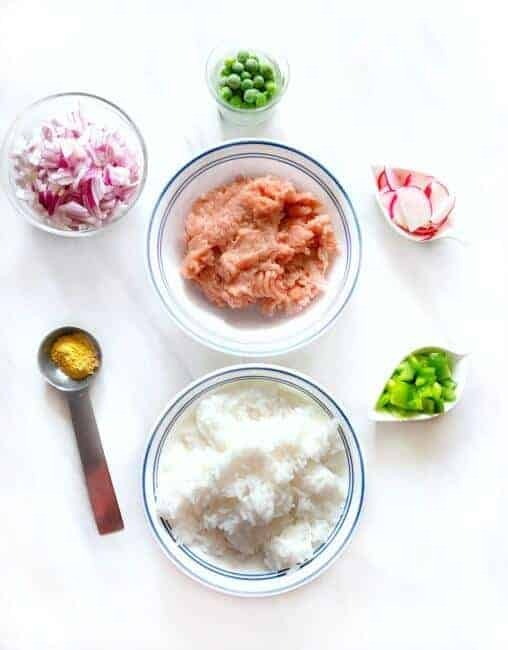 Once you have all these things together, you can put together your Curried Turkey Rice Bowl in few minutes. It tastes so good that you won’t be able to stop at one bowl (I can guarantee you that) and this totally screams #comfortfood (without the calories). First thing first, you need to make the turkey curry using the listed ingredients. This can be made in a deep pan/ pressure cooker or even instant pot. The choice is yours and you cook it as per you cook any other curry dish. Since turkey cooks really fast, I’m making it on a stovetop using a deep pan. Also, since it’s a ‘Turkey Rice Bowl’, hence I’m not adding a lot of water in the Turkey Curry as I don’t want it that thin. For ‘Bowl Recipes‘, I like to keep it thicker, saucy or absolutely less watery. 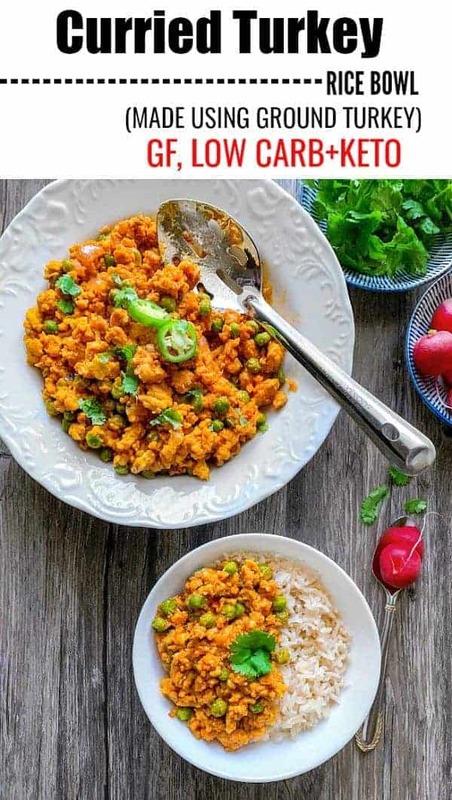 Also, these Curried Turkey Rice Bowl are a twist on a popular Indian minced meat recipe called ‘Keema / Qeemah’ which means minced. It’s traditionally made using red meat such as goat/lamb and some people even use chicken for it. 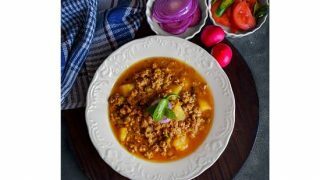 It’s mostly served as a weekend brunch or holds a place during special dinner as the recipe calls for a lot of spices and above all pure ghee / clarified butter. Now when you cook with red meat + all this spices and ghee, the recipe tends to get heavy and definitely takes longer to prepare as red meat takes longer to cook. But when I replaced the meat with turkey (which is lean meat), it cooks much faster and needs less oil and spices. With so many benefits and on my quest to eat healthy yet delicious, I’m swapping turkey in many of my favorite meat recipes. Did you know that turkey has 22 grams of protein in each serving. Now, coming back to the cooking part, if this is your first time cooking curry, you cannot find a recipe easier than this, as I’m using very basic spices like turmeric and curry powder. And I’m also adding my secret ingredient ‘tomato paste’ which adds so much flavor along with this rich color. 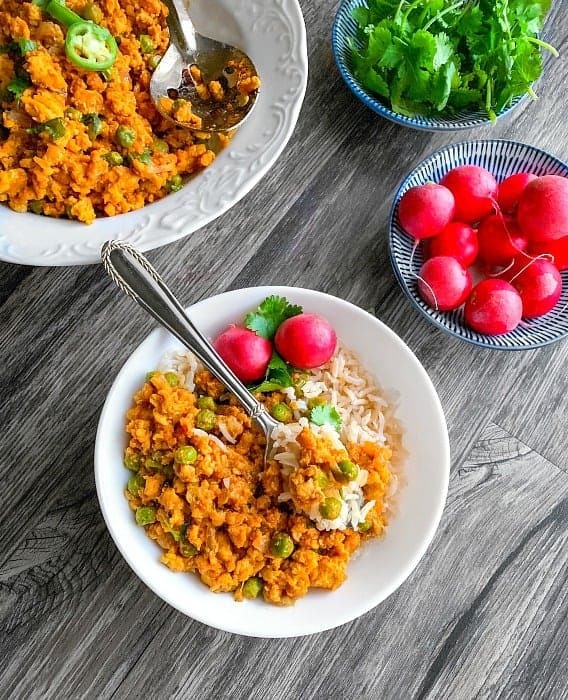 So, chop some onion, get some peas and try making these Curried Turkey Rice Bowl for yourself or share with your entire family. Perfect for Meal Prep as this can be stored in the fridge for up to a week. You just NEED to store the Turkey curry separately and rice in a separate bowl. 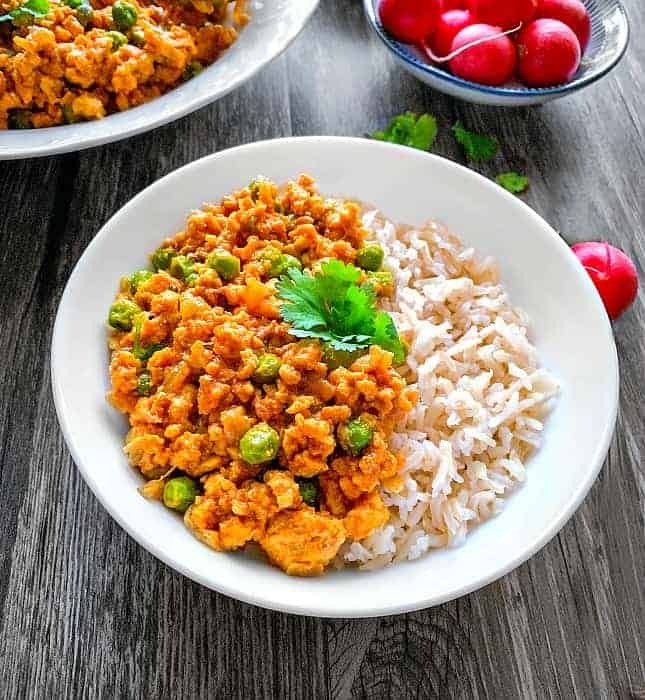 This is one unique way of adding turkey to your everyday recipes and yet keep it absolutely delicious, healthy and easy to cook. Add 3tbsp oil in a panand heat it for a minute. Add onion and saute for 1/2 minute (till onion turn golden). Add all the spices and except curry powder and saute cook for a minute. Add peas and cook for another minute. Now, add minced turkey and saute everything together. Cook for 2-3 minutes on medium heat, till turkey is slightly cooked (keep sautéing in-between). Now, add the tomato paste, curry powder, yogurt and mix everything together. Cover the pan with a lid and let turkey cook over low flames for 3-4 minutes. (saute every minute). Remove the lid after 4 minute, give it a give stir and turn off the heat. Take two bowls and add rice on both. Top with freshly made curried turkey. Now, add toppings of choice like radish / chilies / onions or just sprinkle some lemon and enjoy. **** This Recipe can be stored in the Fridge for upto a week. You NEED to store the Turkey Curry in a separate box and rice separately. 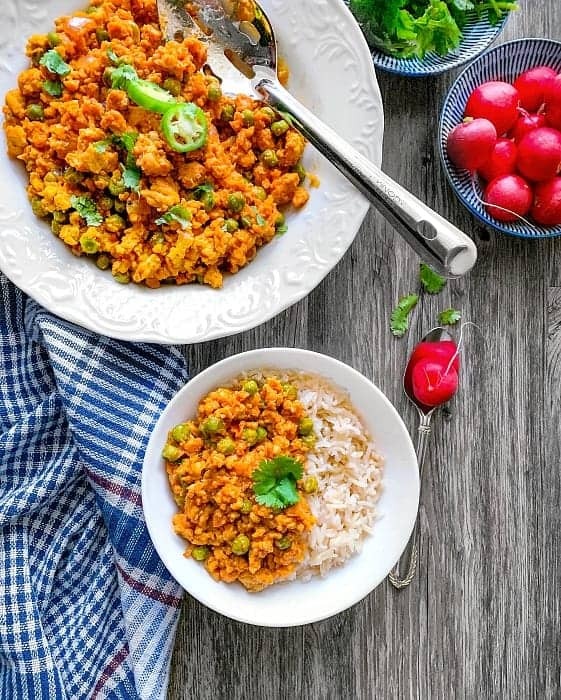 28 Replies to "Quick Curried Turkey Rice Bowl (using Ground Turkey) #ketorecipe"
Curries are amongst the favourite over here in the UK, people can’t have enough of them. I love the idea of a healthy one, plus turkey is such a nice lean meat that goes perfectly well with rice. The seasoning makes all the difference, such a beautiful dish. 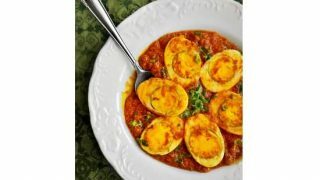 What a great dinner recipe and I can imagine myself getting all comfortable in the couch with a loaded bowl in my hand. Love the quick recipe! I am generally not a fan of turkey because I find it very bland, but this looks super flavorful! I’m always trying to eat more turkey as a lean protein, so I will give this a try. That sounds wonderful Julie. Turkey is such a great lean protein source and mixed with all these spices, its super yum. 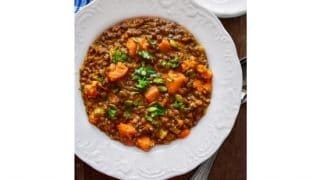 Can’t get over how easy and flavorful this looks and I love that I can easily swap out the turkey for lentils or something to make it veggie! Molly, this rice bowl looks absolutely delicious. Love the spices you used here. It’s a easy healthy dinner, perfect for busy weekdays. Saving this to try! Thanks Byron 🙂 We also love eating these mini radishes and they go so well as sides. I’, so glad you liked the ‘Curried Turkey Bowl’recipe as its so easy to make n flavorful too. Oh I love a good Indian recipe and I like that you used turkey! Looks absolutely delicious with the rice and radishes! Can’t wait to make it! I am a big fan of rice based dishes, they can be so tasty. Using the ketchup to help form the flavor was a great idea. Yes, Molly, I am hesitant about making curries at home. I’m not familiar with Indian cuisine so I really don’t know what a “good” finished product should taste like. I’ll have to try your curried turkey rice bowl. It does look delicious — wish I could come over and have a taste *sigh*. Can’t wait to try it. 15 minutes? I am so there, I love quick meal like this, and it sounds so tasty! 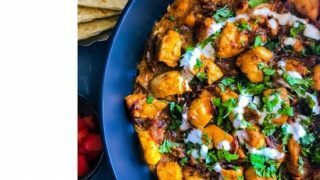 Curries are our go to for dinner, s o I can’t wait to try this one! Thanks Leah. It’s just such an easy peasy meal recipe. This looks like a good option for lunch or a quick weeknight dinner. I love recipes for two! Loving all the herbs and veggies in this recipe. Can’t wait to make this for an easy dinner meal and have leftovers for lunch the next day! This dish looks so delicious! I am always looking for ground turkey recipes as we eat them quite a lot at home. 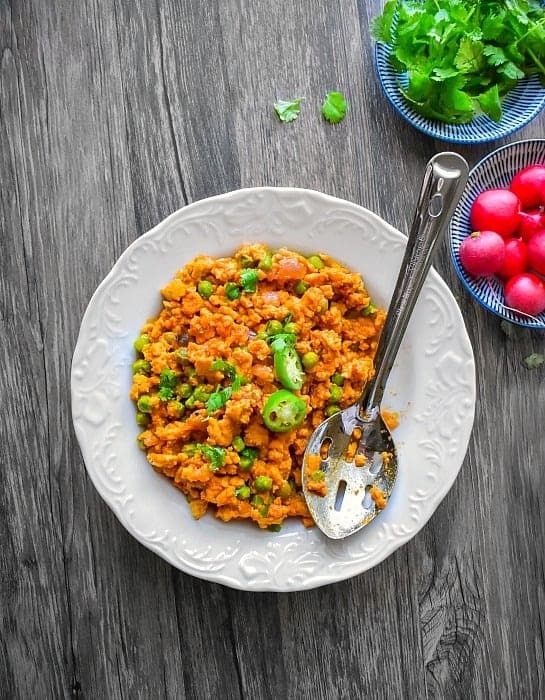 I love the Indian inspired flavors and the fact that is a healthy option! Thanks Kylee. They sure are so easy, quick n yummy to make. I love the ease of this dish. Perfect for a busy weeknight dinner. Love the spices too. 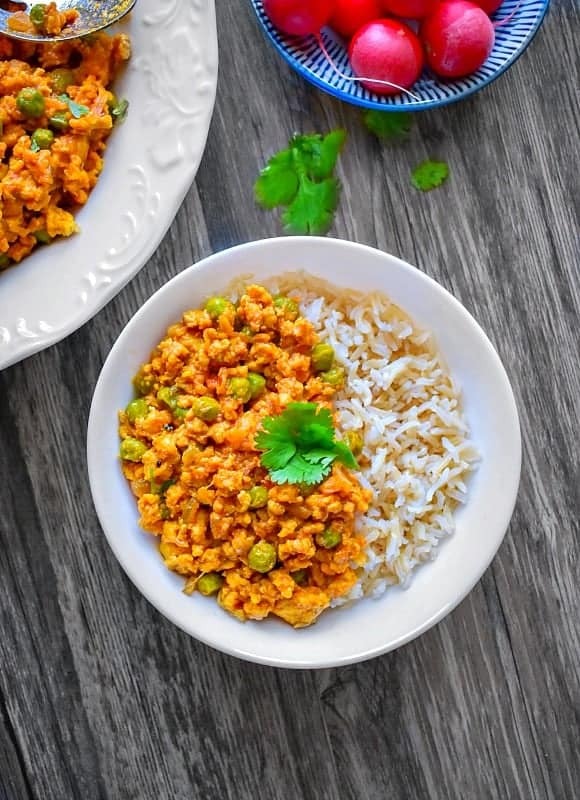 Curries are fun to experiment with, and this sounds like one anyone can make. 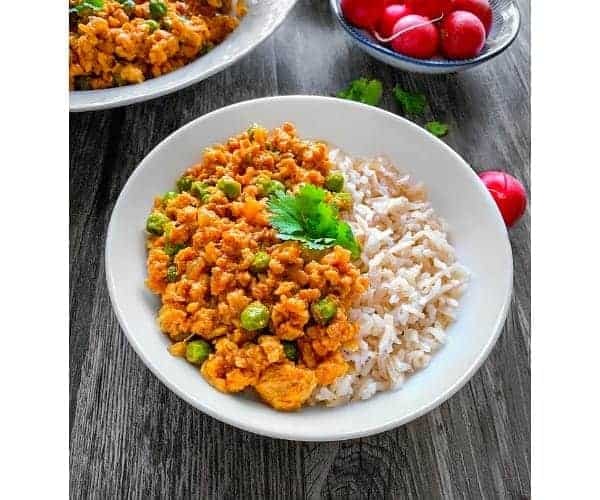 I love quick and healthy and I love curry – this is so awesome.. I bet it was delicious. It sure was so yummy n easy – Thanks Veena n glad you liked the recipe. I love curry and make it all the time! I’m always looking for new recipes– it’s my favorite!